Not to be confused with Alestorm or Hailstorm (disambiguation). 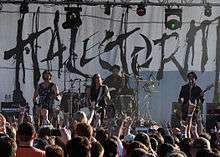 Halestorm is an American rock band from Red Lion, Pennsylvania, consisting of lead vocalist and guitarist Lzzy Hale, her brother drummer and percussionist Arejay Hale, guitarist Joe Hottinger, and bassist Josh Smith. The group's self-titled debut album was released on April 28, 2009, through Atlantic Records. Their second album The Strange Case Of... was released on April 10, 2012. Its lead single "Love Bites (So Do I)" from that album won their first Grammy Award for Best Hard Rock/Metal Performance on February 10, 2013. Halestorm is well known for their near non-stop touring, often performing as many as 250 shows a year. Since 2006 they have toured with many hard rock and heavy metal acts including Alter Bridge, Chevelle, Seether, Staind, Papa Roach, Trapt, Three Days Grace, Theory of a Deadman, Buckcherry, Disturbed, Shinedown, Avenged Sevenfold, Stone Sour, Hellyeah, Heaven & Hell, Evanescence, The Pretty Reckless, Starset, Sevendust and Bullet For My Valentine. Halestorm appeared on the first annual Rockstar Energy Drink Uproar Festival, and in October 2010 the band traveled to Japan to participate in the Loud Park Festival. Halestorm also appeared on the 2010 Taste of Chaos tour. Siblings Arejay and Elizabeth "Lzzy" Hale have been actively writing and performing original music since 1997 when they were 10 and 13 years old, respectively. Lzzy started learning piano at the age of 5; Lzzy later progressed to a keytar, and Arejay the drums. Lzzy took guitar lessons at 16. The teen siblings released an EP titled Don't Mess With the Time Man in 1999. In 2003, Joe Hottinger joined the band. In Halestorm's earlier days, Lzzy and Arejay's father, Roger Hale, played bass before Josh Smith joined the group in 2004. The group signed a recording contract with Atlantic Records on June 28, 2005, and released a live EP titled One and Done on April 28, 2006. The EP, now out of print, featured an early live version of "It's Not You." Their self-titled debut album was released on April 28, 2009. The song "I Get Off" served as the album's lead single. Both the song and video for their second single, "It's Not You", were released in late November 2009. Singles and videos for "Love/Hate Heartbreak" and "Familiar Taste of Poison" were released in 2010. On November 16, 2010 Halestorm released a live CD/DVD entitled Live in Philly 2010, which was recorded at The TLA in Philadelphia in early 2010. On March 22, 2011, Halestorm released an EP called ReAnimate containing covers of songs of different genres, including "Out Ta Get Me" by Guns N' Roses. On January 24, 2012, Halestorm released the EP Hello, It's Mz. Hyde. Their second full-length album, The Strange Case Of... was released on April 10, 2012, in the US, April 9 in the UK, and April 17 in Italy. On October 29, 2012 they were announced as the support for Bullet For My Valentine on their UK tour in March 2013. On December 5, 2012 during a show at the Majestic Theater in Madison, Wisconsin, before Lzzy could start her piano ballad "Break In", guitarist Joe Hottinger ran up to her from off stage and told her that the song "Love Bites...(So Do I)" was nominated for a Grammy in the Best Hard Rock/Metal Performance Category. Drummer Arejay Hale asked on his mic what happened and after Lzzy replied to the audience that they had just been nominated for a Grammy, the crowd erupted in celebration. The entire event was recorded by a fan and posted on YouTube. On February 10, 2013 Halestorm won the award, becoming the first female-fronted band to both be nominated and win in that category. In April 2013, Halestorm reached the top of the Billboard Hot Mainstream Rock Tracks chart for the first time with their single "Freak Like Me". On August 6, 2013, the band premiered their video for "Here's To Us". Halestorm covered the Dio song "Straight Through the Heart" on the tribute album Ronnie James Dio - This Is Your Life, which was released on March 25, 2014. On March 28, 2014 Halestorm performed a brand new song called The Heartbreaker at the Cannery Ballroom in Nashville, Tennessee. In April, the band released a video on YouTube called A Day In The Life Of Halestorm 2014 (Backstage, Interview & New Song Mayhem). The title of the new album was originally set to be released January 13, 2015, but was actually moved a day earlier to January 12. The band has posted letters of the album name allowing for fans to try and unscramble them, and on January 12, 2015, their third full studio album titled "Into the Wild Life" was announced with release dates for the UK and US, April 13 and 14 respectively. In May, 2015 will be released the photo book 'To Hale And Back' in collaboration with photographer Rob Fenn, which documents the career of Halestorm so far. Halestorm on a concert at Carnival of Madness in Laredo, Texas on August 14, 2012. Halestorm was the featured artist on the cover of Origivation magazine in October 2006 and appeared on the cover of Pennsylvania Musician magazine three times (August 1999, March 2000, and February 2003). Lzzy Hale appeared on the cover of Revolver magazine along with Grace Perry from Landmine Marathon in their December 2009 edition of the "Hottest Chicks in Metal." Lzzy Hale has also been noted for her use of Gibson Guitars. Arejay Hale was featured in the June 2010 issue of Modern Drummer magazine. In mid 2012, Halestorm made a special requested appearance in an episode of Bar Rescue, titled "Owner Ousted", where they performed at the grand opening of the Fairfield, Ohio bar America Live (formerly Win, Place or Show). On January 29, 2013 Halestorm performed on Jimmy Kimmel Live!. On February 22 Lzzy Hale sang the Guns N' Roses song "Out Ta Get Me" at Bandit Rock Awards in Stockholm Sweden, where Slash and his band were headlining. Lzzy's vocals are featured in a cover of "Close My Eyes Forever" and on the album of David Draiman's new project, Device. ↑ Tim Grierson. "Halestorm". About.com Entertainment. Retrieved May 15, 2015. ↑ "Discs: Halestorm, 1032K, Willie Nelson, Joshua Bell and Friends". The Buffalo News. October 24, 2013. Retrieved May 15, 2015. ↑ "Lindsey Stirling". Billboard. November 4, 2014. Retrieved May 15, 2015. ↑ Marisa Brown. "Halestorm - Biography - AllMusic". AllMusic. Retrieved May 15, 2015. ↑ "Halestorm Biography". HalestormRocks.com. 2009-07-29. Retrieved 2010-09-23. ↑ "And The GRAMMY Went To ... Halestorm - GRAMMY.com". The GRAMMYs. Retrieved 18 September 2014. ↑ "Halestorm conquers big boys of hard rock to win first Grammy Award". PennLive.com. Retrieved 18 September 2014. ↑ Darling, Gary (May 17, 2010). "20 questions with Joe Hottinger of Halestorm". Taft Midway Driller. Archived from the original on 2012-04-02. Retrieved October 2, 2016. ↑ "Halestorm Hits Everywhere This Week". Marketwire. April 2009. Retrieved July 16, 2010. ↑ "Rockstar Energy Drink UPROAR Festival - Bands". Rockstaruproar.com. Retrieved 2010-05-30. ↑ "Halestorm Releasing Live CD And DVD In November". The RockStar Group. Archived from the original on 2012-02-05. Retrieved October 2, 2016. ↑ "LOUD PARK 10:: OFFICIAL SITE - NEWS" (in Japanese). July 9, 2010. Retrieved July 16, 2010. ↑ "Nu Rock Traxx volume 135 - ERG Music's DJ CD Compilations". Ergmusic.com. Retrieved 2010-05-30. ↑ "IT'S COMING! Halestorm to release "Live in Philly 2010" CD/DVD in 2011". HalestormRocks.com. 2010-10-19. Archived from the original on 2012-03-11. Retrieved 2016-10-02. ↑ "Halestorm Announce New Album, 'The Strange Case Of…' and Premiere Music". Revolver Magazine. 2012-01-24. Retrieved February 9, 2012. ↑ "Loudwire, May 11, 2012". Loudwire. Retrieved 18 September 2014. ↑ "Lzzy Hale's reaction to her Grammy nomination". December 6, 2012. ↑ "Halestorm Premiere Here's To Us Video". UpVenue. Retrieved 18 September 2014. ↑ "Halestorm will release the photo book 'To Hale And Back'". ↑ "Lzzy Hale Plays up a Storm with Gibson". Gibson.com. Retrieved 2010-05-30. ↑ "Device - Device". AllMusic. Retrieved November 5, 2015. Wikimedia Commons has media related to Halestorm.